The entrance is about 10’ from parking spot. The exterior door is 29″ wide and the dead bolt is 39” above floor. HVAC remote is mounted within 54” of floor. Both the bathroom door handle and wash basin handle are operated without twisting the wrist. Toilet seat is 17” high. Bed access is 32” wide on each side. Bathroom has a 28” wide door and a 27”x54” shower, but it is not a roll-in and there is no seat. Bathroom clearance is 29”. There are no grab bars around toilet or in shower. There is no clearance under the wash basin. 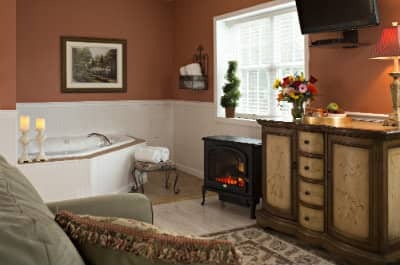 A favorite for private vacations in the Hershey, PA area, our cottage rental at 1825 Inn is separate from the main house. This getaway option features a private entrance and entrance porch with two chairs. 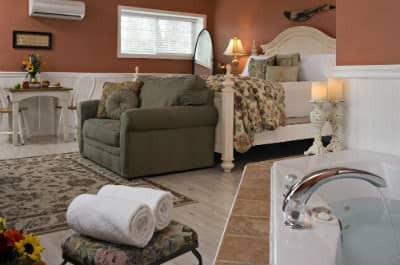 Comfort surrounds you when you step into the cozy building with its warm colors, rich floral area rugs, mix of traditional and painted furniture, and free-standing fireplace. Bring a bottle of wine and experience the Jacuzzi for two; it does wonders for the mind, body, and soul! Slip into one of the fabulously luxurious bathrobes and settle in for an evening of relaxation.The large bed with its luxurious pillow-top mattress and appointed with the best linens offers an amazing night’s rest. A dual-head, five-foot shower and thick soft towels let you start your morning off right. And of course, come on over to the Main House for a delicious breakfast before you begin your day’s adventures. 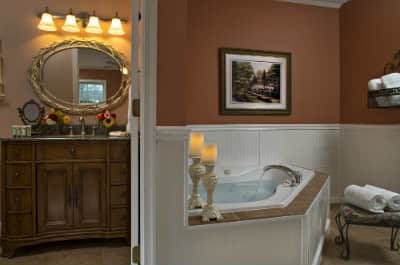 Make the Country Cottage your choice for a perfect, quiet, and relaxing getaway. You’ll be glad you did!